More than 43,000 men lost their lives at Gettysburg, one of the bloodiest battles taking place on American soil. This book commemorates - through photographs - the 50th and 75th anniversaries of the Battle of Gettysburg. The reunions marking these anniversaries were of critical importance to both Civil War scholars and participants who survived the great conflict. The reunions were covered by national media and did much to complete the healing of the wounds of war. 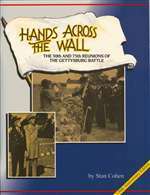 Hands Across the Wall contains photographs documenting moments such as the recreation of Pickett’s Charge; President Wilson’s arrival at the 50th reunion; President Roosevelt’s arrival at the 75th anniversary reunion; and the unveiling of the Eternal Light Peace Memorial.